Here you have two recipes. It is your lucky day! My sister-n-law made this fruit dip for us when we visited them last. I positively could not get enough of it. 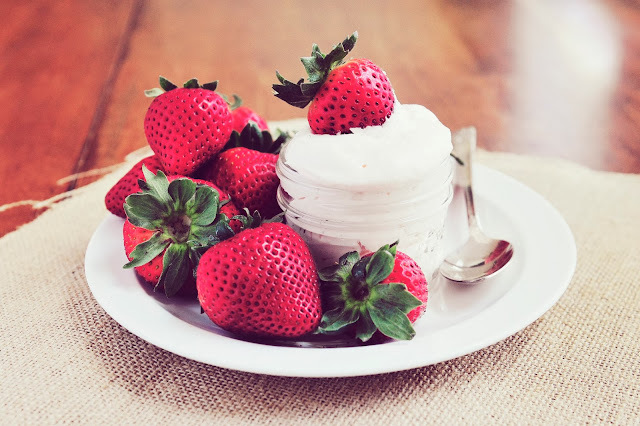 I felt so guilty every time I scooped my strawberry or pineapple piece into the luscious dip. I must have looked like a little piggy and quite honestly, I did not care. OOPS, did I say that out loud. I am not going to lie, there is no way to make this healthy. I tried to make a batch using rice syrup instead of the corn syrup and that was a total fail. I had to reconcile the fact that it is a treat and no matter how hard I tried it was not going to be any other way than sweet, sweet and super good. If you are a reader of my blog then you know that I try my best to make most things from scratch. To buy the jar of premade marshmallow was something I just did not want to do so I decided to try my hand at making this version. I found the original version from one of my favorite blogs, A Farm Girl Dabbles. I love her blog because she also likes to cook from scratch and use whole ingredients. I found the homemade version tasted cleaner. I didn't have a strange after taste like I did with the jar version. 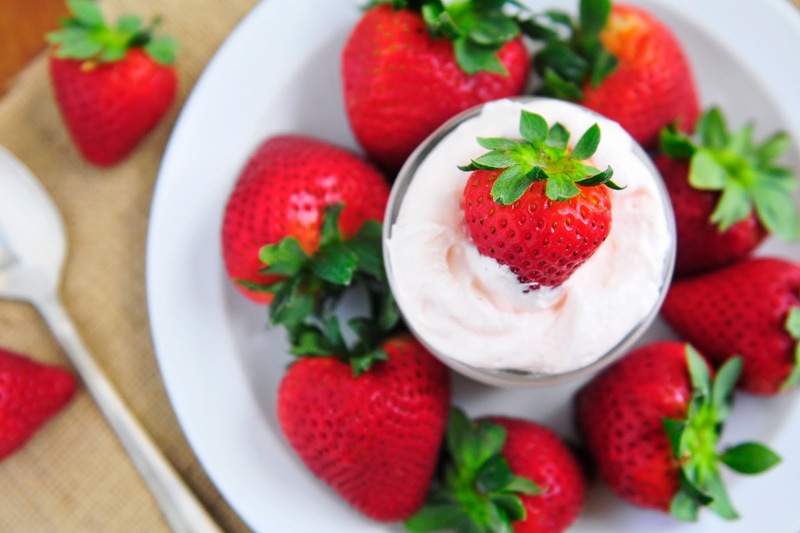 We are a few months out from having fresh strawberries in our local farmers markets but with Valentine's right around the corner I thought a few of you may want to make this dip for school parties, work events or a little something special for your sweetie pie. 2. Fold in marshmallow cream, juice and nutmeg. 4. Serve with your favorite sliced and prepared fruits. 1. In a small saucepan with heat set to medium high, add water, corn syrup and the 2/3 cup of sugar. Cook until boiling. Continue cooking and stirring (see note below) until mixture reaches 240 degrees on a candy thermometer. Remove from heat. You do not need to stir the whole time. Just once in a while to keep the bottom from scorching. 2. While step number one is cooking and reaching the desired temperature, you can beat the egg whites with the cream of tartar. The whites should be light and frothy right before you add the 2 tablespoons of sugar. Continue beating until soft peaks form. Set aside until syrup from step one is ready. The easiest way to do this step is using a table top mixer. I used my kitchenaid. 3. 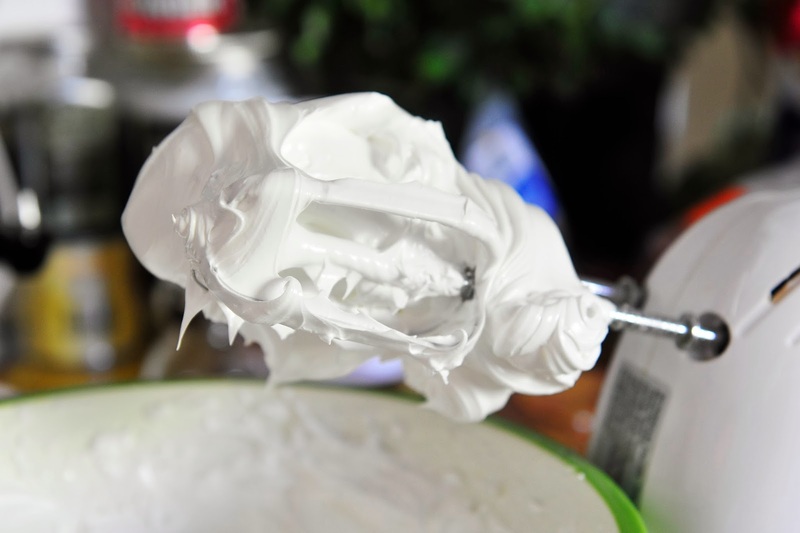 Grab the bowl with the egg whites, set your mixer, with the whisk attachment, to low and s.l.o.w.l.y start pouring the hot syrup into the egg whites. As egg whites start to stiffen, increase the speed to high. Beat on high for 7-9 minutes until the mixture is stiff and glossy. 4. Add vanilla and beat until combined, maybe one more minute.